There are a number of 2012 model touring caravans which come with an impressive range of safety and security devices as standard, earning you a range of insurance discounts which mean cheaper premiums every year. Having good security and safety devices fitted to your caravan not only gives you additional peace of mind, but it can also help to really knock down the cost of your annual caravan insurance. As such we want to highlight the new 2012 model caravans which have the best safety and security devices fitted as standard, in order to help you get cheaper caravan insurance. All of the below refers only to ‘as standard’ security. The below have an approved tracking device (25% Caravan Guard insurance discount), alarm system (5% discount), axle wheel lock (10% discount), and electronic anti snaking device (5% discount). The Vanmaster Occasion 640 has an approved tracking device, alarm system, and electronic anti snaking device, but no axle wheel lock. The Bailey Pegasus caravans have an axle wheel lock and electronic anti snaking device, but no alarm. The full range of Stealth caravans have an alarm fitted and a receiver for an AL-KO Secure axle wheel lock, but only the Intrepid T58 supplies the lock as standard. Are you buying a used caravan that qualifies for insurance safety and security discounts? If you’re buying a used tourer, ask the dealer or seller about security features that the caravan comes with. 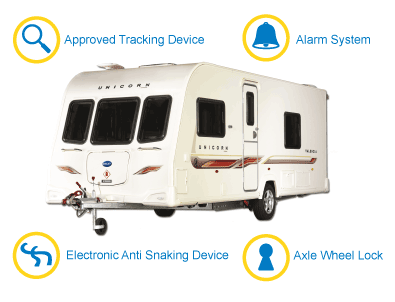 For many years caravan manufacturers have been fitting alarm systems. Since 2006 a long list of manufacturers that use an AL-KO Chassis such as Bailey, Swift, Lunar and Coachman have been fitting the AL-KO Secure system or receiver for it to many of their models. Similarly top of the range Elddis ‘vans such as the Crusader have been supplied with the BPW Diamond Axle Wheel Lock. Beyond that in 2009 and 2010 Swift were fitting the Hal Locate tracking device to their top end ranges such as the Conqueror. Lunar and Coachman’s decision to fit Phantom Proactive to their top end models in 2012 is a continuation of a strategy that began on models in 2010. Bailey Unicorn has been ultra secure since its first launch in 2010 and the first generation Bailey Pegasus was fitted with a Tracker Monitor, alarm, AL-KO Secure and AL-KO ATC so is an insurance discount magnet! It’s also worth bearing in mind regardless of security being a standard fit, previous owners may have added devices for their own peace of mind or to meet insurance policy security requirements. As long the devices are still operational they will lower your insurance price. A tracking device fitted to a used tourer may need to be transferred into your name and reactivated so it’s a good idea to call the manufacturer of the device and pay a small fee to get it back up and running. More and more caravan chassis are now being manufactured with a receiver for an AL-KO Secure axle wheel lock. Popular models such as the Swift Challenger and Conqueror, Sterling Eccles or Elite, Coachman Pastiche or Amara, Lunar Quaser, Arriva, Stellar and Lexon, and the Bailey Olympus and Orion all come with the receiver for the AL-KO Secure. If you buy the locking mechanism for such devices for a few hundred pounds or so, it will provide a much greater level of security than a regular wheelclamp and bag you a significant insurance discount for many years to come. An alarm system is also a cost effective way to protect your caravan, and reduce your insurance premium, and again these can be purchased and fitted relatively cheaply. Tracking devices earn the biggest insurance discounts but also cost the most to install and run – don’t be tempted to go for cheaper versions which don’t charge a subscription fee as these don’t provide the same level of protection as fully monitored, pro-active devices, which are also the only type which will earn you an insurance discount with Caravan Guard. For more information on approved tracking devices visit our caravan tracking device page. We also offer other discounts such as those for a claim free caravan insurance record and for members of caravanning clubs. For more information visit our caravan insurance discounts page. The information provided in this article is correct to the best of our knowledge as of the date of publication (05/12/11). If any manufacturer believes any of the information given to be incorrect then please email us on info@caravanguard.co.uk and we will be happy to amend.